2005 is the year of handhelds. While Sony goes the traditional way of throwing out a high-end system packed in slick design, Nintendo tries to find new paths of gaming. 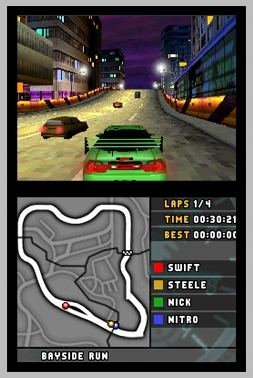 Nintendo DS (Dual-Screen) combines good graphics (on the level of Nintendo 64) with innovative gameplay. The two screens, with one of them (the lower one) touchable, and the built-in microphone promise gameplay you've never experienced before. Sony's PSP (Playstation Portable) focuses more on general multimedia by creating a new storage type (Universal Media Disc), supporting standard flash cards and providing the ability of playing MP3s and videos on the fly. So, what's it gonna be? The first thing you'll notice if you compare DS to PSP is the price. With around 250 US Dollars the PSP is almost twice as expensive as the DS! If you're not confident with the 32 MB memory card that comes with the PSP then you'll have to buy a new one too (1 GB costs around 60 bucks). Also, it is suggested that you buy some kind of case to protect PSP's screen, which is highly susceptible to dust and scratches, unlike Nintendo's screens which are automatically protected when you close the DS. Games cost around 50 dollars for both handhelds. Sony also wants to publish movies on UMDs, which will cost approximately 20 dollars each. You will only get the movie though, while on DVD you'd get the movie with all the special features and different subtitles and languages for the same price. That's why rumor has it that the new UMD will not get off the floor as anticipated by Sony. Once you get over the price differences, most people compare the graphics. 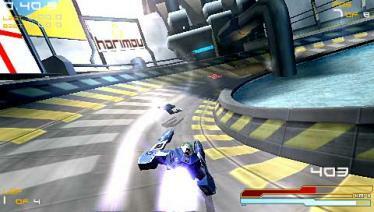 If you show someone your PSP they will be stunned how something so small can create pictures in PS2 quality. If you demonstrate the abilities of your DS most people will realize the pixelized textures, caused by having no texture filter. However, they will be stunned when they see how you play the games with your stylus on the touch screen (if they can see the screen next to your hand). Nintendo obviously tries to focus more on gameplay, which can be good and bad. It can be good because the new input options (touch screen, 2 screens, microphone) have a huge potential for developers, though it can be bad if the developers don't come up with any good and innovative ideas. Also, it might be true that the screens are protected when you close the DS, but since the stylus is totally made of plastic, it might leave minor scratches on the touch screen after a while. Speaking of games, PSP again chooses the traditional way of making new versions of previous releases. There are only a few names that you haven't already heard a dozen times. 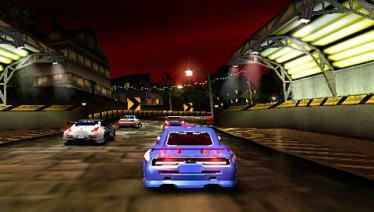 Need for Speed, Ridge Racer, Wipeout, Tony Hawk, NBA, NHL to name a few, GTA is already announced. Nintendo offers old names too, but promises fresh gameplay experiences. Like Wario Ware, which contains roughly 180 mini games. Each of them runs for 5 seconds, like connecting stuff, evading, drawing etc. While it can be fun, people complain that the new gameplay gets old quick. Either it is because of the game (and the repeating minigames) or because they get tired of their stylus. PSP has already received the first complaints about dead pixels on the sold displays. Also, one of the action buttons sometimes gets stuck for no reason. Sony admitted that it's a design fault and it will probably (and hopefully) be fixed in the next version. Apart from hardware they're already supporting the PSP with software updates. Upcoming features include a webbrowser, email clients and text readers. You'll be able to use PSP's built-in wireless lan to connect to a hotspot and browser the internet. It is not announced for DS, but technically it would be possible since it also features wireless lan technology. There's already a chatprogram called PictoChat that comes with the DS, which let's you talk to other DS owners up to a distance of 40 meters. But of course, both Nintendo and Sony had the idea that ultimately people will be able to connect to hotspots and play their games over the internet. Nintendo is known for making games for children. But what most people don't realize is that Nintendo tries to convert adults as well as their kids, like last year with the release of Gameboy Advance SP and titles like Doom. Nintendo DS is actually not a follower of the Gameboy and aimed at a larger audience than just kids ("Metroid Prime Hunter" should prove it). Nintendo said that DS is a totally different field than their Gameboy products, and they'll probably announce more details about the upcoming new Gameboy generation this year. PSP is obviously more of an adult product. With the slick design and the expensive price it will become a status symbol among handhelds. The ability to play movies and MP3 files will attract an even wider audience. Sony even claims that PSP will be the walkman of the 21st century. In conclusion, if you buy a PSP you can play high quality games, watch movies and listen to MP3's (approximately 3-4 hours before you need to recharge it, half the time of DS). If you buy a DS you'll be able to experience new ideas, but you shall be warned that it's not everyone's thing. On a side note, while Nintendo and Sony are fighting against each other and fans of both sides are spamming the message boards, another handheld gets completely forgotten. Microsoft's answer to the flop of Nokia's N-Gage will also be released this year. With "Gizmondo" you'll be able to send SMS, MMS, play games, movies and music, and of course, it can be used as a mobile phone. With the next Gameboy probably also released this year, on christmas 2005 people will be able to choose from four different handhelds, not to mention the still selling GBA SP. Personal comment: I tend to buy a DS. Sony tries to blend your eyes with design and graphics, I doubt that those PSP games are still fun after 2 hours of playing. I have the same doubts for the current selection of DS games, though, but I've seen some previews of really interesting games, like a new Kirby game which will only be controlled by the touch screen. Also, I think we're in need of new ideas and Nintendo has proven not to be a coward by throwing out an experiment without knowing if it's going to sell well or not. 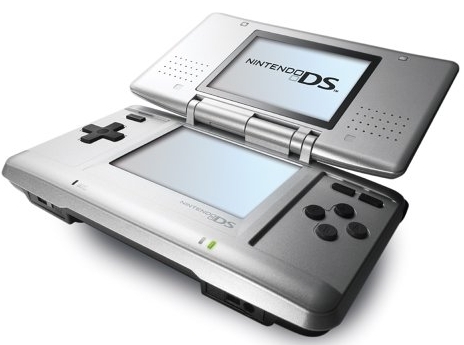 Obviously, in Japan and America the DS is a huge success, that's probably why even we Europeans have the honor to buy this gadget. I still don't have my DS and I suggest that if you want to buy one, wait a bit until new games are out, the prices drop and different colors can be chosen from (I want a black DS!). Besides, please forget Gizmondo. And the last addition: There's a small device called GBA Movie player that lets you play movies and music on your GBA/DS and it costs only 25 bucks (plus 50 for compact flash card and card reader). I've ordered one and I'm gonna tell you more about it once I hold it in my hands.